Buy our top quality cleaning products to help your floors and upholstery stay protected and looking perfect in between your annual professional cleanings. You can have our high-quality cleaning products in your own home and you will be thrilled with the effectiveness before we come back for a deeper clean. They last a long time and will do the job for all your household accidents. Why not protect your biggest investment? The Pet Enzyme Treatment will work for any pet stains, and even some human accidents when you have little ones running around. The Multi-Surface Maintainer will keep your wood floors and tile looking great and disinfected until we return for your next cleaning. The Spot Remover will take care of any smaller spills to prevent staining. You won’t be disappointed! 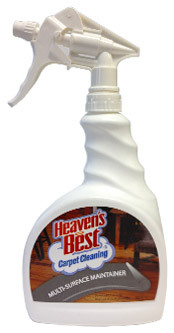 The Heaven's Best Spotter Solution is uniquely formulated to remove most non-permanent spots and stains from Carpet and Upholstery. Our customers love the way this spotter works being gentle on the carpet and upholstery and safe for their children and pets. You will be amazed at how well this product works. This product is a great daily or weekly cleaner for granite counter tops, ceramic or porcelain tile, wood floors, stainless steel appliances, and windows or mirrors. 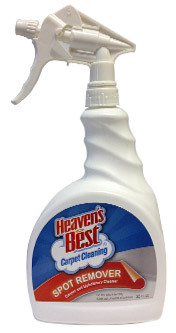 This gentle but powerful cleaner is ideal for a wide variety of house hold surfaces. 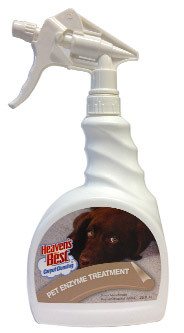 This product is a must for anyone who has a pet. When an unfortunate accident occurs just saturate the area with our product. Our effective formulation will break down the urine or feces changing its molecular makeup to eliminate odor and staining. This product works great in between professional cleanings.